Bloggin' 'bout Books: Blue Bloods vs. Secret Society: A Few Too Many Similarities? Blue Bloods vs. Secret Society: A Few Too Many Similarities? 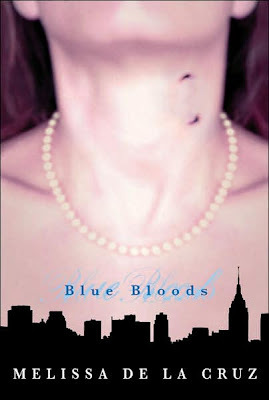 The first book in de la Cruz's series - Blue Bloods - introduces us to the creme de la creme of New York society. Graced with wealth and privilege, it's a group whose family roots stretch back to the Mayflower. The new generation swaggers through the doors of the elite Duchesne School swathed in True Religion jeans, tottering on Manolo Blahnik heels, and swinging the newest Prada handbags. Chauffered Town Cars whisk them home to their Park Avenue penthouses or off to Neiman Marcus for a session with their personal shoppers. The Manhattan social scene cares less about their age than about the limitless funds on their credit cards - weekends sail by in a swirl of frothy drinks, glittery parties and celebrity companionship. With their trust funds, $500 highlights, and closets jammed with designer pieces, the new generation is just as rich, just as powerful, just as glamorous as its elders. Although her blue-blooded ancestry makes her one of the elite, 15-year-old Schuyler van Alen hardly fits in with the snooty, moneyed crowd. Although her family's fortune made Manhattan what it is, the money's long gone. It's just as well - Schuyler's style has always been more vintage than Versace. She's content enough dressing like a bag lady, hanging out with her best friend Oliver, and watching the in-crowd from afar. There's only one problem: Schuyler's changing. Not only is she seeing weird things, but her blue veins seem to be popping out of her skin. Oddest of all, Duchesne god Jack Force is suddenly paying a lot of attention to her. Then comes the invitation that changes everything. A summons from The Committe reveals the secret of the Blue Bloods, the secret of what she and her friends really are - vampyres. Only Schuyler's not quite the same as the others, which makes her a very enticing target. Secret Society begins with a familiar scene: wealthy teenagers lined up outside a trendy nightclub, waiting admission into an inner sanctum filled with drinks, drugs and pretty playboys. The kids come from the upper echelon of New York's high society - their parents are business tycoons, society ladies and politicians. Like their elders, the new generation sops up the designer labels, the Upper East Side prep schools, and the VVIP lounges in the city's glitziest clubs. The most promising of them are inducted into The Society, a group so hush-hush no one's sure if it really exists. Phoebe Dowling, a 16-year-old transplant from L.A., hardly considers herself among the elite upperclass. Sure, she's attending the prestigious Chadwick School, but inclusion into its in-crowd hasn't been exactly forthcoming. A chance encounter with handsome Nick Bell changes all that. Suddenly, she's getting invitations to the most exclusive parties, one of which leaves her with a woozy head, an ankh tattoo on her neck, and a forced loyalty to The Society. Before she really knows what's happening, Phoebe's jumping at The Society's every command, attending a dizzying array of late-night parties, moving in circles approved by its leadership, and asking no questions. At first, it's incredible - she's finally experiencing the New York she's always dreamed about. By some miracle, she's even managed to land a show at an exclusive art gallery. Everything she's ever desired is now within her grasp. So, why is she so unhappy? Why does the silly little club terrify her? And why are her friends disappearing? It's becoming more and more obvious that The Society doesn't just give - it also takes. Everything. Like I said, the plots of these two books diverge enough that they're not identical, but the similarities are many. The New York settings, the privileged cast members, the prestigious prep schools, the secret societies - it's all there. Both books feature teenagers with absent parents who don't notice or don't care that their underage children are parading all over the city drinking, smoking, snorting coke and cozying up with anyone who's willing. Speaking of parents (and grandparents), characters in both Blue Bloods and Secret Society discover theirs are harboring some serious - and similar - secrets of their own. There's also the issue of Schuyler Van Alen and Patchfield Evans - the former lives with her grandmother in a once stunning, now dillapidated palace, muses on her family's dwindling wealth, visits her comatose mother on the weekends, and wonders about the father who died when she was an infant; Patch (of Secret Society) also lives with his Gram in a crumbling dwelling with a prestigious address, ruminates that "he and his grandmother had the oldest kind of old money: the kind that didn't exist anymore" (17), spends time at the hospital where his mother has been institutionalized, and misses the father who died when he was a child. Uncanny, don't you think? The other big similarity between Blue Bloods and Secret Society (note the matching 2-word, alliterative titles) is that I didn't love either one. None of the characters in either book develop much, the writing's similarly stiff, and both plots need work. 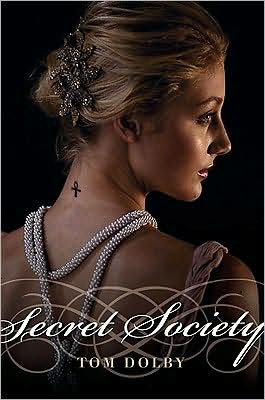 That being said, I think Secret Society is the better book. It has more depth, more believable conflict, and more sympathetic characters. I still don't get all the whys and wherefores of it, but at least it didn't get as ridiculous as Blue Bloods did. I know you're all dying for the answer to the big question: Will I be reading the sequels? Since Disney so kindly sent me the rest of the Blue Bloods series to review, I will be reading it. If I didn't have the books on hand, I wouldn't bother. As for Secret Society, the semi-cliffhanger ending makes it pretty obvious that a sequel is forthcoming. Yes, I will be reading it. Why? Because even though I didn't love the book, I liked it enough to care about what happens to the characters. So, yeah. Pretty ho-hum about these two. Oh dear...well I enjoy the Blue Bloods series and I have Secret Society in the review pile, so eventually I'll probably be posting my irritation too. Sigh. Is it so wrong to just want to love every single book I read? Maybe it's just me - I haven't loved anything I've read in the past couple weeks. And maybe these two books aren't really all that alike, but for me, the similarities were glaring and really distracting. I'll be interested to hear your opinion, Amanda! I am a librarian and I have read both of the books mentioned in the interview and I thought it might be worthwhile to point out a couple of facts that seem to have escaped the reviewer and might warrant a correction. Burrowing is fairly common among YA authors. I think Blue Bloods burrowed a little from Gossip Girl, a book that was more popular around the time that Blue Bloods was initially released. Secret Society in turn burrows (somewhat more heavily) from Blue Bloods. What the reviewer fails to mention is that Blue was released four years before Secret Society. It would be impossible for the two authors to have burrowed from each other. The author of the later book (Secret Society) obviously burrowing or mimicking the author of the earlier book (Blue Bloods). Thanks for your comment, Annie. I agree that YA authors - all authors really - constantly "burrow" from each other. That's why I get so excited when I find something fresh and new. It's so unexpected, you know? I think we all appreciate an original. I must not have been very clear in my review - it's obvious that if there was any "burrowing" going on it was Dolby "burrowing" from de la Cruz since BLUE BLOODS has been out for a while and SECRET SOCIETY is not on the market yet. If I inferred that it was the other way around, I certainly didn't mean to. Thanks for clarifying! Interesting analysis! (esp the two-word alliterating titles... a keen observation ;9)I haven't read Secret Society but the two books do sound eerily similar. I don't know if the author of Secret Society copied some ideas or whether it was a subconscious copying or maybe it's a freakish coincidence. But judging from the way you described them, they do have "a few many similarities".